Being surrounded by exotic beauties, Ahmedabad can also be called the perfect getaway into the beauty of Gujarat. Dwarka is one amongst these beautiful places which are easily accessible from Ahmedabad. Located on the western coast of Gujarat, Dwarka is one of the oldest cities in India as it is believed to be formed during the times of Lord Krishna. Hence, it is also considered one of the holiest places and is a prominent part of the Char Dham pilgrimage in India. If you are looking to learn more about this spiritual town of Dwarka and plan a trip from Ahmedabad to Dwarka, then you have reached the right post. As the summers remain extremely hot with the maximum temperature reaching above average scale, it is wise to avoid visiting Dwarka during the summer season. The best time to visit Dwarka is from October until the end of March as during this period, the temperature is below average and the weather is cool and pleasant. By Air: You can take a flight to Jamnagar Airport and then from there you can hire a cab to Dwarka. Jamnagar Airport is located at a distance of about 135 km from Dwarka. By Rail: There are direct trains available between Dwarka and Ahmedabad. By Road: Located at an approximate distance of 440 km, Dwarka is easily accessible by road from Ahmedabad and other major cities. However, route 1 is preferable as it will take half an hour lesser in comparison to route 1. While on your way to Dwarka, you can take a break at the following places. Rajkot is one of the fastest growing cities in the state of Gujarat and is popular for its contribution during the struggle for independence. It has been a home to Mahatma Gandhi, and several historical monuments built within its boundaries prove the fact. The major places of interest in Rajkot include Mohandas Gandhi High School, Watson Museum and Kaba Gandhi No Delo. Jamnagar should be your en route destination while heading towards Dwarka as this beautiful city is home to numerous wonderful places. Being one of the largest industrial cities in Gujarat, it also harbours several oil industries, hence, giving it the name of Oil City. Adorned with historical monuments to lakes and forts, Jamnagar is a must-visit place if you would love to explore the history of the state. The prominent places of interest in Jamnagar include Lakhota Fort, Lakhota Lake, Shantinath Mandir, Khambhalia Gate, etc. Once you have stepped on the divine land of Dwarka, you will definitely get surprised on witnessing its unseen magnificence and beauty. Even though it is considered a pilgrimage site in Hinduism, it still attracts several tourists on account of its natural beauty. Following are the major places which should not be missed if you desire to enjoy the entire beauty of the town. Dwarkadhish Temple is the major attraction in Dwarka throughout the year and is located in the centre of the town. Dedicated to Lord Vishnu, this temple is believed to built by Raja Jagat Singh and dates back thousands of years. Being one of the holiest places, it is said that it is impossible to achieve salvation unless you have paid your respects at Dwarkadhish Temple. It is five-storeyed building settled over 72 pillars with two entrances. The entry door is known as Moksha Dwar, the door to salvation, and the exit door is known as Swargadwar, the door to heaven. Isn't it alluring and interesting? So, why not get yourself under the shades of this divine temple? Dwarka Beach is another spot which draws tourists towards this pilgrim town. At the time of dawn and dusk, you can find people relaxing amidst the shining rocks and the glittering sand of the Dwarka Beach. It also provides its visitors with certain opportunities of fishing and photography. Located at a distance of around 30 km from the centre of Dwarka, Bet Dwarka is a strip of sand and stone at the mouth of Gulf of Kutch. This tiny inhabited island is said to be the abode of Lord Krishna and is believed to the original settlement of Dwarka. 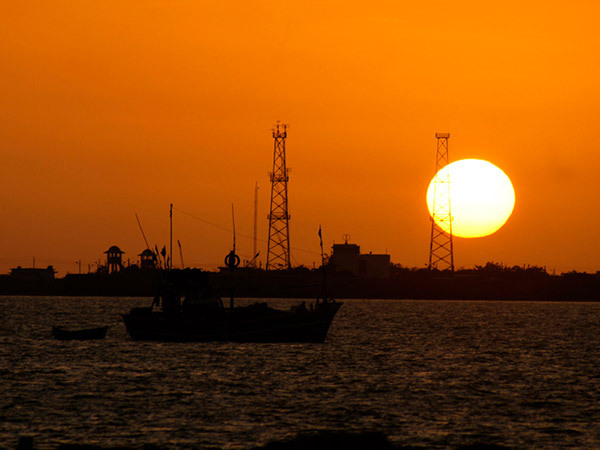 Surrounded by several sparkling sand beaches, Bet Dwarka can be reached by ferries from the coast of Okha. Even though several remains of the ancient city on this land have been found underwater, the exact time of its formation is still unknown. Rukmini Devi Temple is one of the oldest temples in Gujarat with its history dating back thousands of years. During the festive seasons, this temple remains crowded with Hindu devotees who come here to worship Goddess Rukmini and get blessings in return. Beautifully carved sculptures of gods and goddesses and intricate patterns and designs on the walls and ceilings make this temple a must-visit for history lovers and architecture enthusiast.